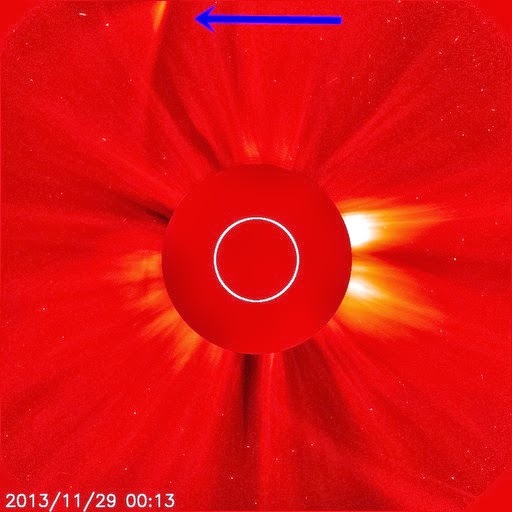 There’s a lot of confusion, after comet ISON flew through the sun's atmosphere on Nov. 28th. We have been watching Comet ISON all day long and after perihelion, experts, amateur astronomers and those watching the comet all seem to be seeing different things. Some say ISON disintegrated, others says Ison is whole and intact and others wondering still, if ISON disintegrated where is the debris headed. According to NASA the comet is believed to have broken up and evaporated. 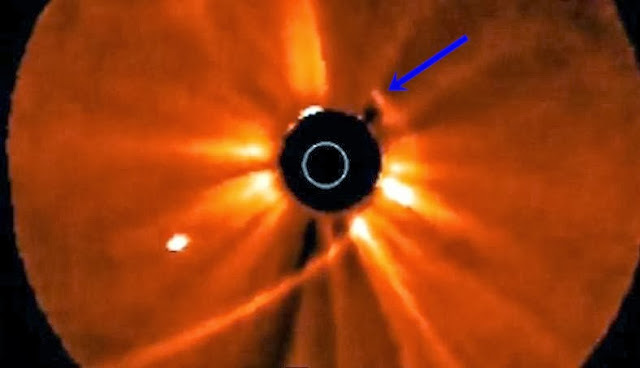 These images from NASA's Solar Terrestrial Relations Observatory and the ESA/NASA Solar and Heliospheric Observatory show Comet ISON growing dim as it made the journey around the sun. 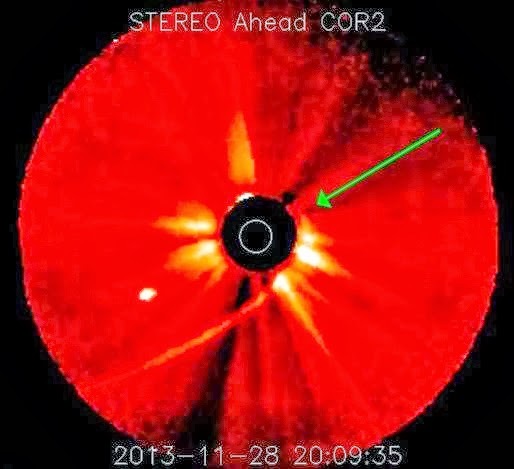 The comet was not visible at all in NASA's Solar Dynamics Observatory. 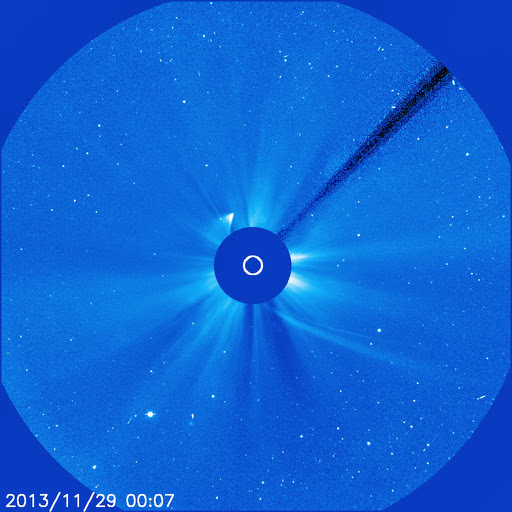 According to Spaceweather: Comet ISON flew through the sun's atmosphere on Nov. 28th and the encounter did not go well for the icy comet. Just before perihelion (closest approach to the sun) the comet rapidly faded and appeared to disintegrate. 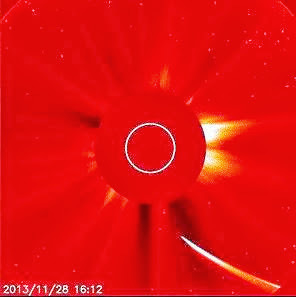 This prompted reports of ISON's demise. However, a fraction of the comet might have survived. Comet ISON seems to be falling apart as it approaches the sun. Indeed, researchers working with NASA's Solar Dynamics Observatory said they saw nothing along the track that ISON was expected to follow through the sun's atmosphere. Nevertheless, something has emerged. Whether this is a small scorched fragment of Comet ISON's nucleus or perhaps a "headless comet"--a stream of debris marking the remains of the comet's disintegrated core--remains to be seen. Comet Ison holding predicted path. ARE THEY LYING ABOUT ISON? 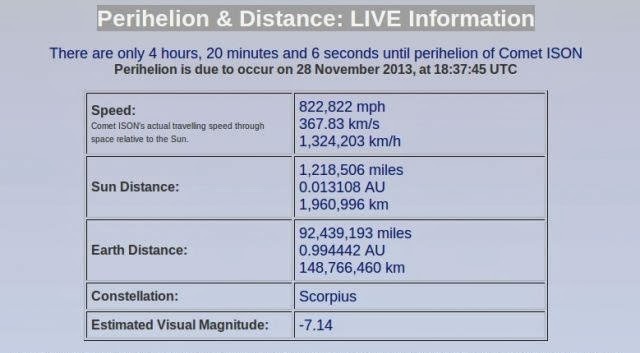 For example: Comet ISON 2013: Perihelion & Distance: LIVE Information. 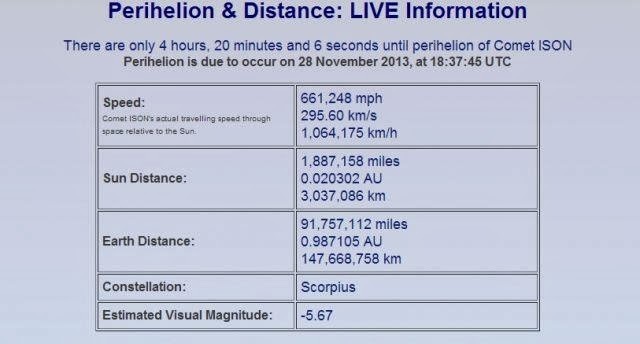 The Live information shows us totally different speeds and distances from the sun at the exact same time. Why are they giving us two different sets of data? Despite a fleet of satellites monitoring the comet, using high resolution cameras, NASA still don't know for sure what has happened to Comet ISON, I wonder what’s really going on. You do realise that the first pic that you use to show that ISON is alive is a troll photoshop from 4chan? Thanks for the info, I did not realize. Meanwhile I have uploaded the correct first image. So why would they lie about all this? Is it because it presents a real danger now? NASA cover up yet again, at least that is something we can all agree on!